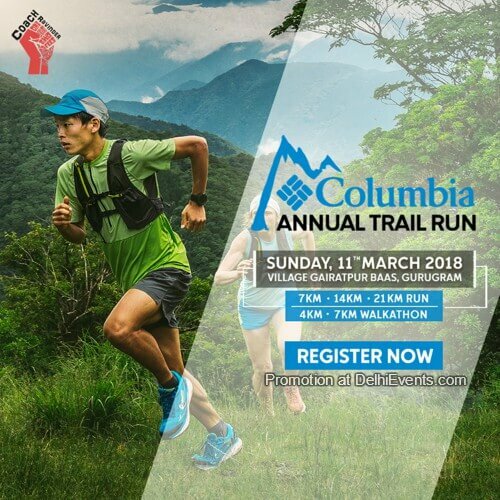 Event Description : The Columbia Annual Trail Run (ATR) is an initiative to introduce people to the outdoors, encourage them to choose trails over treadmills and create new experiences for runners in the outdoors. Conducted in partnership with Coach Ravinder Singh, one of the best running coaches across the country, Running enthusiasts will be given an opportunity to experience the tough, scenic, and virgin trail in Aravalis through the 5 categories of run including 7 Km run ,14 Km, 21km along with a 4 and 7 Km Walkathon. Trail running not just brings one closer to nature but also paves way to get out of the concrete jungle and the hustle-bustle of city life. Many running trails in India are primitive, composed of dirt, sand, mud, grass, and rocks. The number of Trail running events have been increasing year on year, with enthusiasts preferring to escape the city pollution and run in cleaner environments.